Review: "Chris Green Quartet: A Group Effort" - Sea of Tranquility - The Web Destination for Progressive Music! 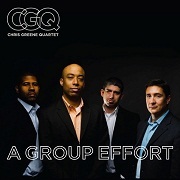 A Group Effort is the fifth release from the Chris Green Quartet, a Chicago jazz act featuring saxophonist Chris Greene, pianist Damian Espinosa, bassist Marc Piane, and drummer Steve Corley. It also happens to be a live album, recorded at The Mayne Stage on October 27,2011, and is being released on Single Malt Recordings. Single malt and jazz? Sounds like a great combination! If you take a quick look at the song lengths below, you'll notice there's nothing here under 10 minutes, so expect plenty of extended arrangements, soaring musical passages, and tons of improvisations. These guys certainly know how to solo, led by the super talents of Green, who is quite an impressive sax player. First track "Bride of Congeniality" lets all the musicians jump into the fray, firing off powerful solos in between some memorable melodies. Espinosa's fiery electric piano really plays off Green's smoky sax quite well on this one. "Shore Up" features some wild free jazz and bebop, while "Future Emperor of Evanston" is a more majestic number that sees Espinosa doing double duty on acoustic & electric piano. Classic jazz fans will love "Stat", which is a great vehicle for the rhythm section, and the duo of Piane and Corley again strut their stuff on the locked in, somewhat funky "Three & Six", as Green and Espinosa soar over the top. Look for a fantastic drum solo on the jazz classic "Blue Bossa", which closes out the set in fine fashion. If you live in the Chicago area, I highly recommend you find a way to check out the Chris Green Quartet. These cats know how to play, and have come up with some seriously good original jazz material that features memorable melodies and boatloads of improvisations.